For more tips on creating with the Cherry Blossom Retreat collection, watch the tutorial at https://youtu.be/OaA2da5H-E0. Instructions: Click here to view a larger photo of this project. Take the 6" cardboard circle and glue a paper doily on top of it. Take the 2 empty rolls and cover them on the inside and outside with the paper from the collection. Ink the edges with Archival Coffee ink. Take the circle die with the scalloped edge and die cut 3 circles from green designer paper. Take the 4" cardboard circles, adhere one green eyelet circle on top of each one. The 3rd eyelet circle will be used later. Glue one cardboard circle and one empty tape roll together. Do this twice. Glue one on the 4" circle base using hot glue. Take the sheet of clear cardstock and roll this up so that the height is 8 1/5" and that it fits into the cardboard roll. Put adhesive tape on the edge of the clear cardstock and adhere together. Glue the clear tube in the base using hot glue. Take the other roll and place this on top like a lid, don't glue this one down so you can fill it with chocolate eggs. Adhere the remaining eyelet circle on top of the lid. Now decorate the candy jar. Use hot glue to decorate the rolls with flat back pearls and a string of pearls as shown. 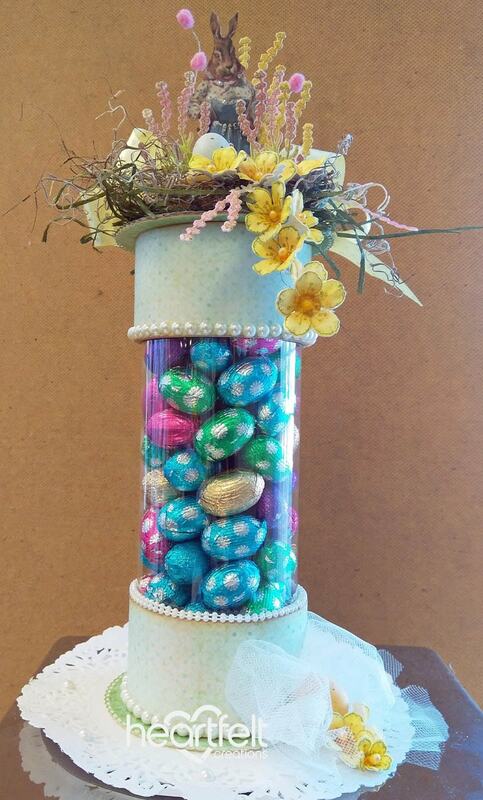 Make a bow of tulle and place this on the bottom, in front of the tube and glue a small plastic egg on it. Cut the rabbit image out using scissors and place it on top of the tube with a small piece of acetate. Make a nice bow out of ribbon and place this behind the rabbit. Stamp the backyard filler flowers and the cherry blossoms with Bamboo Leaves ink on white cardstock, color the backyard flowers with Magenta Hue and Buttercup ink. Color the cherry blossoms with Buttercup ink and the center with Sunflower ink. Die cut and place them in the 3D mold, spray them light with water and put the lid on it then run it through your machine. Pierce a hole in the center and insert a stamen. Take 5 cherry blossoms and hot glue each one on a small strip of florist wire, then twist the wires together staggered, so you have a vine of flowers. Now take the florist tape and wrap it all around, so that the flowers are stuck in that tape. Use more hot glue if necessary to keep the flowers in place on the vine. Hot glue one end of the vine to the top of the lid, and bend or shape it as desired. Glue some moss and grass in front of the rabbit, add 5 small plastic eggs. Adhere the backyard filler flowers around the rabbit, adding some pom pom wire behind it. Finally add remaining cherry blossoms to complete the cherry blossom vine. Glue additional cherry blossoms to the base of the tube.